Yes, it has only been a year, and I'm asking again. I have maintained OLDaily and the rest of this website at my own expense since 2001. It is not subsidized by my employer or anyone else. I've always been happy to do it, but I need your help. Click here to Donate. This site gets a lot of traffic - 476K unique visitors and almost five million page views in 2017. 1690.37 gigabytes of traffic. On average, it has cost $125 a month for the last ten years (currently, it's $US 140, or almost $200 Canadian, per month). Thank you to everyone who helped last year. I raised just over $3000, which paid for the server and the traffic. I am committed to keeping all my services and resources free, and will not add a subscription to any part of my website, ever. That's a promise. So if you help me provide this service, I'd be happy to recognize your contribution, as thanks, on my Donation Page. I'll file this one under 'pedagogy of harmony' though the fit is a bit uneasy. Thom Markham taskes as a point of departure the end of the transmission model of learning asks "what now?" He observes that in today's world, more than ever, people learn together, an d "living a densely linked life and operating in a non-linear, intimately connected, globally diverse, culturally conflicted world... requires entirely new thinking about learning itself." To learn, on this new model, he suggests, may be to develop empathy, where empathy is characterized not merely asd a cognitive state but also a physiological state. Markham adds that "in the transmission model, learning is very much geared toward self-fulfillment; in the new model, we can expect empathy to shift the focus to the common good." "Facebook has no idea what you want," writes Eric Ravenscraft in this scathing review of the social network site's news feed. It tends to focus on recently added friends andf frequently-posting people as well as controversy (as signified by engagement) and, of course, advertisements (a.k.a. "promoted posts"). Users can't really define what they want to see (just what they don't, and Facebook "seems to re-follow some people if you unfollow too many"). The reason the feed is so bad is that you wouldn't use it if it only showed you what you want to see. "Facebook’s never going to reach a point where they say 'Well, that’s all your close friends have to say! Maybe you should go outside.'" So it fills your feed full of junk to keep you scrolling. This article from lasty May showed up (deservedly) in a year-end wrap-up. 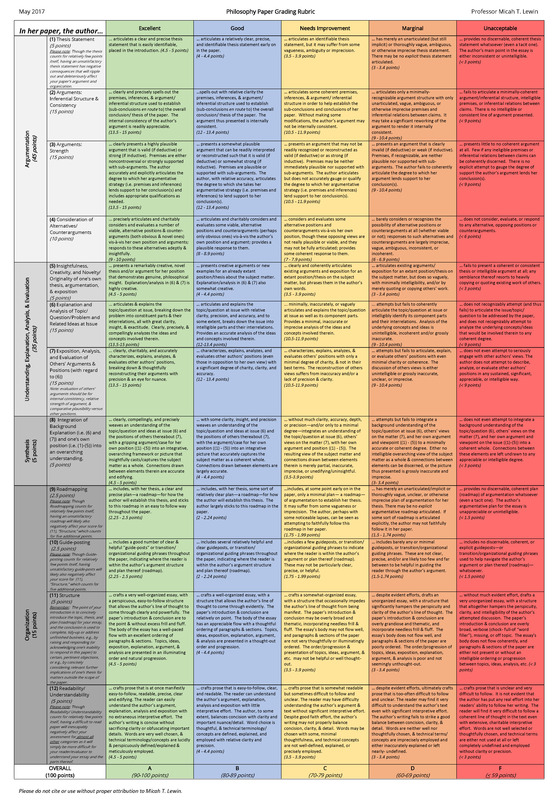 As the title suggests, it is an impressively detailed rubric for grading philosophy papers (and, frankly, would serve as an excellent rubric for grading most essays in general, with perhaps some token points for correctly describing the 'content' of various subjects. The diagram is hard to read in the article so here is a link to the full JPG file. Ud there's a weakness, I would like to see a consideration for other types of reasoning besides 'argumentation' (for example, explanation, extrapolation, compare-and-contrast, etc). But those could be easily inserted into the diagram. Whatever Happened to the Coalition of Essential Schools? The Coalition of Essential Schools (CES) was an initiative launched in 1987 that "spread rapidly across the nation throughout the 1990s (see here, here, and here)." Based on a set of ten principles (listed in the article) the coalition sought to encourage a matery-based and personally-supportive mode of education based on a generally constructivist pedagogy. It reach a peak of more than 1,000 schools in 1997 but since dwindled ro fewer than 100 in 2017. CES, writes Cuban, "shut its national office doors in 2018" (which must mean today, since yesterday was a holiday) a victin of dwindling funding and loss of organizational focus. Note that even is some given service or product is free, if the provider employs these lock-in strategies it could have the effect or requiring payment for free goods.